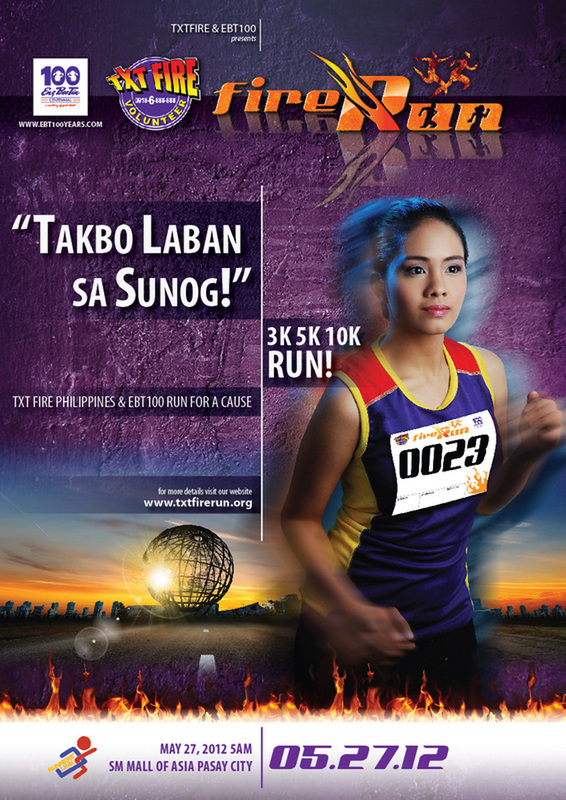 TxtFire Philippines, a non-profit foundation, holds its first TxtFire Run dubbed as "Takbo Laban sa Sunog" on May 27, 2012 at the SM Mall of Asia grounds. In celebration of Eng Bee Tin's 100th anniversary, the popular Chinese bakery also joins its efforts in this advocacy run. TxtFire is an advocacy project helping people prevent fires and save lives. The running event aims to raise awareness in fire safety and also raise funds for the deployment of several units of ICEBOX or In Case of Emergency Box to public hospitals and institutions all over Metro Manila. 1. The event is open to male and female participants who are fit to run, jog and walk. 2. All participants are required to accomplish completely and entry form with a waiver statement. Those below 18 years old are required to have the entry form signed by their parents or guardians. Registration forms shall be considered valid only if properly filled-up, signed and paid for. Participants who commence before the actual start time of his/her race will be disqualified. 5. Top 3 winner male and female for each category will be receiving a medal and gift packs. All finishers will be receiving a certificate. 6. Biggest Delegation Award. The top three group participants (company, running club, school, etc.) with the most number of registrants joining the race will receive a trophy. Group must have a minimum of 25 registered participants to qualify for the Biggest Delegation. A separate award will be given to the Bombero Team with a minimum of 15 registered runners. Each team/group is requested to submit their entry forms at the same time. 7. Family Category Award is open to any families who will be joining the 3KM event with a minimum of 3 participants and a maximum of 5 participants. Each participant will be paying a corresponding registration fee of P300.00/participant. The family members should cross the finish line at the same time. Trophy will be given to the family who crosses the finished line first. 8. All participants must wear their assigned Race Number on his/her chest. Participants not wearing their Race Number will be taken off the course and is not allowed to win. 9. Race category and Race Number are strictly non-transferable. 10. The organizer reserve the right to use any photographs, motion pictures, recordings or any other media records of the TXTFIRE RUN: Takbo! Laban sa Sunog for any legitimate purpose, including commercial advertising without any giving monetary consideration to the participant. 12. The organizer reserves the right to alter without prior notice any of these rules and regulations which they may deem necessary to ensure the success of the event. 13. The organizer’s decision is final. ◦ SM North EDSA "The Block"
◦ Market Market "Bonifacio Global City"
AND SUBMIT THEM TO THE REGISTRATION CENTERS as listed above. For more information on registration, sponsorship and other details regarding the race, you may contact the Secretriat of TxtFire Run thru (632) 986-8888 or (0922) 339-9777.